This article is written jointly with Rakesh Prasad Pandey, Research Scholar in the Department of English at APS University, Rewa, MP. Hindu mythology is a detailed and systematised structure. Many times we study the structure but ignore the message behind it. In the present paper we try to present an anatomy of Indian mythology with its underlying message.It is important not to miss the spirit, intention and message of our mythology. It is one the most complicated, complex and hierarchal patterns in the world. It is layered and colourful. It needs explanation and simplification at every level. The word “Mythology”comes from west. “Myths are imaginative traditions about the nature, history and destiny of the world, the gods, man and society. They are treated here as concepts which deserve serious attention, for what they mean to those who believe in them and as statements about fundamental issues of life.” (Cavendish 8). This is a comprehensive definition but sometimes even such a definition is not sufficient in the Indian context. In India, myth often mixes with history, religion and beliefs. 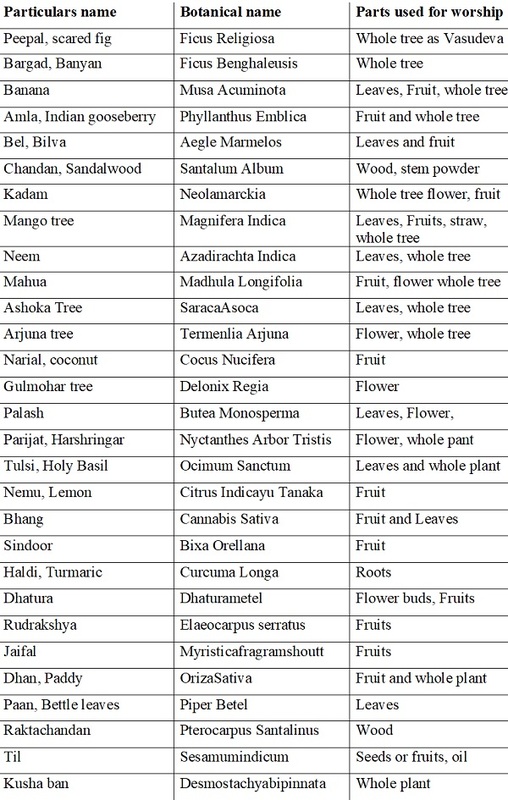 We have a body of Vedas, Itihas, Sanskaras, Upinishads, Puranas and Shastras. In India we have the concept of Avatar. An Avatar is not a Prophet or messenger. An avatar is a reincarnation of the supreme, divine force; similarly dharma is not a religion. Because dharma is a duty performed through virtues. The western concept of myth is related to a traditional tale and is related to folklore, legends, parables etc. In India the belief system has evolved for the last ten thousand years. It is not pagan. It often reflects the highest form of thinking and civilization. Vedas, Upnishads, and Puranas have no authors. No author can claim authorship over these scriptures. This magnanimous and huge knowledge reservoir initially passed from generation to generation through the oral tradition. Later, the knowledge treasure was scripted. It should be clear that the words “Mythology” and “Myth” are being used because English language offers only these terms. The word “Myth” is inadequate because the Indian knowledge system explains existence, structure of society, human rights, animal rights and rights of planet earth. The purpose of the scriptures is to explain existence and give purpose to it. It is a complete system within itself. The element of faith and complete belief gives these myths a larger than life presence. The Indian consciousness recognises Swabhava = swa+bhava. The core of Indian belief is to each according to his or her nature. Individual nature and inclination is supreme. That is why there is the concept of Ishtdevta “Individual God”. Every individual is given the freedom to choose her or his own god according to her or his personality. The individuality of a person is recognised. The Individual is given the reason to develop consciousness and evolve as human being. There is no limit to human evolution. A human being has the possibility to develop her or himself into the omniscient, almighty power. Every human being is an atman (Soul) and can develop herself or himself into Param atman (Super Soul). The boundary between human and God can be erased. We can visualise this as a river flowing into the ocean. The same divine element is present in everybody. This is unique to Indian thought process. This process of osmosis, fusion or mixing of the divine and the ordinary is unique to Indian thinking. Many times the western scholars fail to comprehend it. For them a religion is a set of rules. For them religion means reward and punishment. But Hindu religion is not codified. It is not a strict religion. Nothing is compulsory. In Indian traditions no body is condemned for ever. Everybody, howsoever low, sinful, petty, marginalised or miserable has a chance to grow. Every soul can be redeemed. 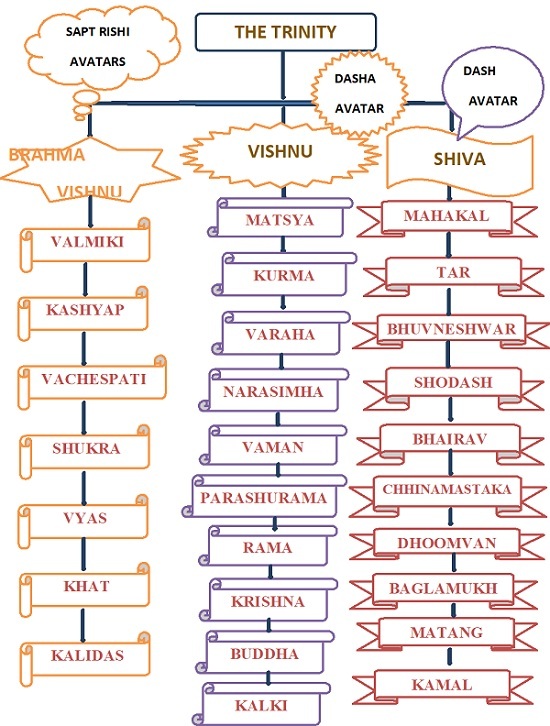 The concept of Moksha or Nirvana is again unique to Indian thought system. We do not have the concept of dooms day or kayamat. There is nothing like final punishment. In Indian philosophy and religion “Moksha (also known as mukti) is the concept of ultimate freedom and liberation. Derived from the Sanskrit word mukt which means liberation, release and emancipation, it is the release from the limitations of a wordily existence. To reach the state of moksha is to attain absolute freedom, peace and oneness with the Divine. Moksha is similar to the Buddhist concept of nirvana”. Keeping in view the spirit of India spiritual traditions, Indian sages since time immemorial have perceived the divine element in all that is manifest- plants, trees, birds, wood, rocks, river, planets, human beings, spirits, animals, oceans, sea, water, reptiles, insects, soil, earth, grass, lake, pond, well, etc. Everything is worshiped. Our deities are reflections of the natural phenomena. Shiva symbolises water, planet moon, reptile snake, weapon Trishool, musical instrument Damroo, the skin of tiger and so many other forces. The western mind often fails to comprehend the infirmity of the Indian Pantheon. They wonder why there are so many gods and goddesses. A vulture, an owl, a monkey, a snake, a boar, thousands of plants, trees, rocks- why are so many forms worshiped? They get confused; they think it is a crowded place. They fail to recognise that each individual is unique, and each moment, age, place, and circumstance is unique and therefore needs a special form of worship. The divine energy pervades all that is manifest. An individual can concentrate at the feet of the divine energy in any form. The Indian philosophy believes in one Supreme Being, the source of all energy, the fountain of all motivation or almighty God. There are three dimensions of the supreme power - Brahma, Vishnu and Shiva. There are three fundamental aspects of God. Brahma is the creator. Brahma signifies effort. Brahma stands for all human endeavours. The process of creation, construction, development, movement and building are reflected in Brahma. Vishnu is the preserver of creation. Vishnu is the living essence of universe. 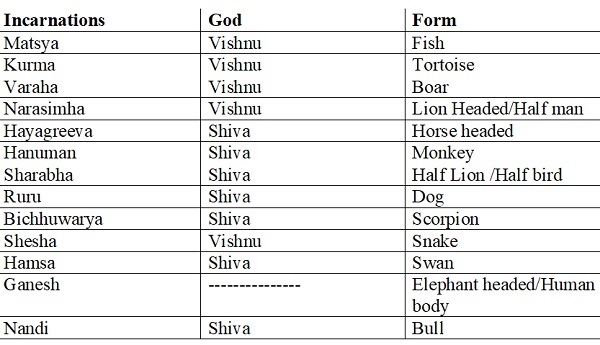 In simple terms we can identify Vishnu with “Being”. We can say that Vishnu signifies patience, calmness, happiness, bliss, and enjoyment of this universe. Shiva is the destroyer. Hindu philosophy believes that destruction is essential for construction. The old, the obsolete, the dilapidated, the worn off, the tired and the broken must die. Why should it die? Because the new is to be born. The old is transformed into new. Shiva, the destroyer is the transformer or the changing agent. He is the revealer. The death caused by Shiva is rebirth in the real sense. In this manner, the cycle of existence is completed–effort, being and then change. In Indian philosophy, “Death” is not the end. It is a change. It is viewed as a travelling junction where a different journey starts. The soul changes its clothing. The chart presents the Trinity of Gods with their major Avatars. One of the fundamental pillars of Indian thought is the concept of Shakti. It is noteworthy that the primordial cosmic energy is female. Shakti can be understood as power, ability, strength, might, effort, and capability. 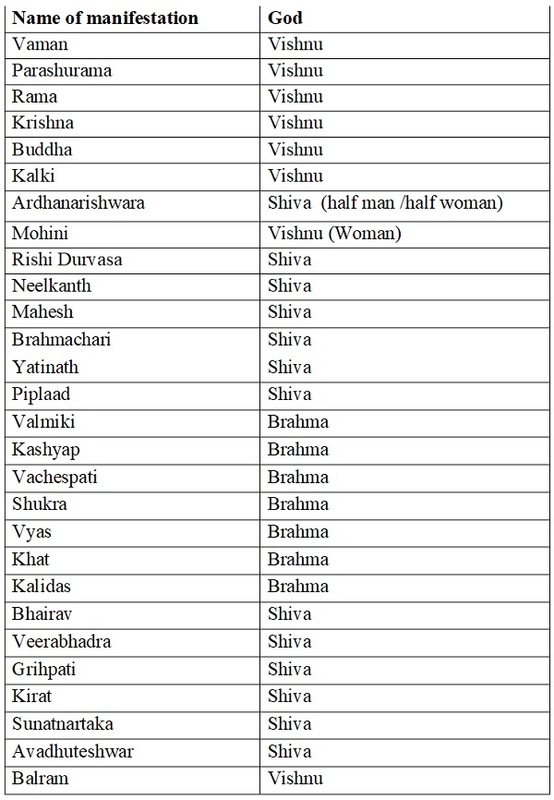 All root Sanskrit and Hindi words depicting at the above mentioned forces are feminine- Shakti, Aadi Shakti, Aadipara Shakti, Prakriti, Urja, Bijli, utpattti, kshamata, pratibha, yogyata etc. In India, it is a continuous tradition of worshiping of the female energy. It is almost eight thousand to ten thousand years that we can see the living tradition of the worship of Shakti. It is the personification of the divine feminine creative power. It is also associated with fertility. Indian sages believe that Shakti is present in males also. It is present in males in a potential, unmanifest form. The men walking on the spiritual path go through intense tapa or training to invoke and awaken their feminine energy. To awaken the sleeping energy Kundilini is part of the occult science of Tantra. Swami Ramkrishna Paramhansa spent a considerable strength of his life time as a woman in order to realize Shakti. Brahma, Vishnu, and Shiva have their leading goddesses, who awaken them of their famine part. Brahamani, Vaishnavi, Maheshwari, Indrani, Kumari, Varahi, and Chamundi are considered to be the major Shakti of the Trinity of Gods. In South India she is known as Amma. David R. Kinsley, one of the leading authorities on the concept of Shakti in the Indian thought says, “One of the most striking characteristics of the ancient and multifaceted Hindu religious tradition is the importance of goddesses worship. A considerable number of goddesses are known in the earliest Hindu scriptures, the Vedic hymns. In contemporary Hinduism the number and popularity of goddesses are remarkable. No other living religious tradition displays such an ancient, continuous and diverse history of goddesses worship. The Hindu tradition provides the richest source of mythology, theology, and worship available to students interested in goddesses.” (Kinsley). Anyone who does not understand the underlined principles of Shakti does not understand the soul of Indian Philosophy. Shakti is what vibrates through existence. It is the cause of all movement. The Supreme Being has many manifestations, incarnations or avatars. All imaginable forms of existence are interlinked and are worship worthy. All manifestations of the divine energy have their place, position, and importance. Nothing is unimportant. Co-existence with flora and fauna and animals, birds, amphibians are woven into Indian thought. All parts of the ecosystem are crucial to existence. Often it is seen that in intellectual discourse some scholars bring the practical, prevailing, real life problems to problematize Indian thought. It is true that India is not “living” her philosophy in reality in all aspects of life, but then no country or no society is doing so. What sets apart Indian mythology is the sense of belief of the general public in it. We have tried to present an anatomy of Indian mythology in a concise, ideal, and theoretical form. We have tried to present the idea behind Indian Mythology in its distilled form. How the society is functioning is a topic of study for sociologists and other social scientists. If we look at the intention and the thought-content of Indian mythology, we will come to know that its aim is peace, pluralism, co-existence, progress and prosperity. Happiness is the ultimate aim of Indian mythology. - Cavendish, Richard. Mythology.Little,Brown and Company(UK) Ltd. 1992. - Kinsley, David R. Hindu Goddesses.University of California Press. 1988. Really very intersting and fruitful . The article is knowageable, based on research and very interesting.